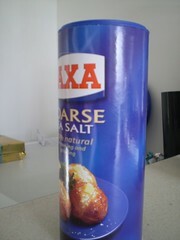 Further, from the packaging, it makes it look like your supposed to use “Arse Salt” on your steaming hot balls. . . . The big question I will be stuck with this weekend now is “what is the use for it?”, and once I’ve figured that out, I’ll probably be curious what it was doing in your kitchen. Have a nice weekend Lloyd. Is your fave film Arse Salt on Precinct 13?